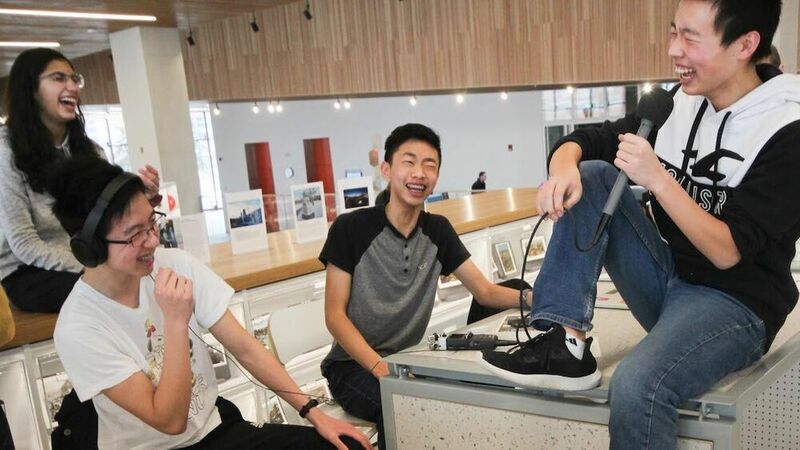 This Sprawlcast was recorded at the new Central Library on February 2. 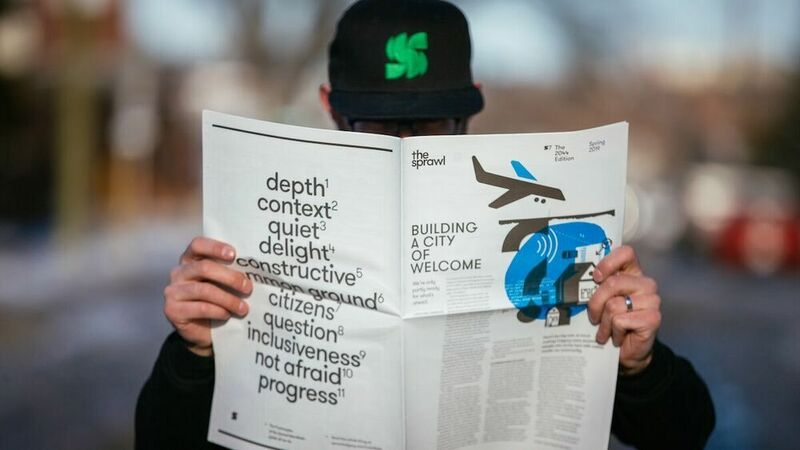 It's part of The Sprawl's 2044 Edition, which is all about the future of Calgary. Host Jeremy Klaszus interviewed author Shaun Hunter, urban planner Francisco Alaniz Uribe and city councillor Jyoti Gondek. 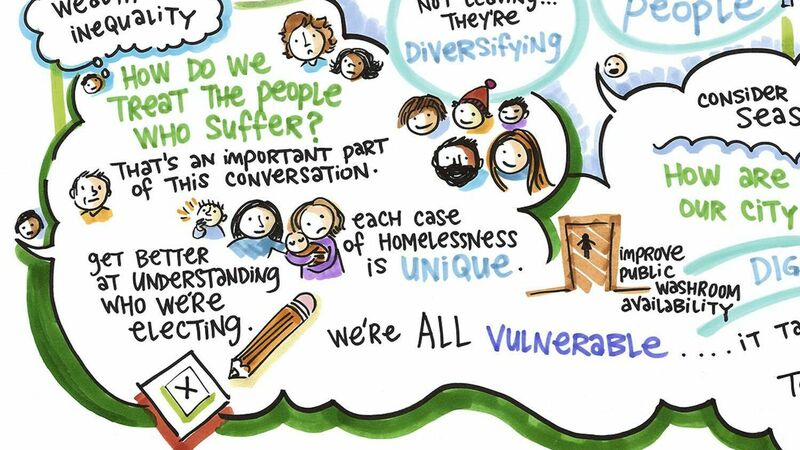 During the event, comic artist Sam Hester (aka The Listener) made an epic graphic recording of the conversation. Check it out below! A full transcript of the episode is also below. 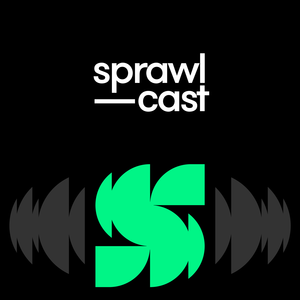 If you value independent Calgary journalism, please sign up as a monthly supporter of The Sprawl. Your support means we can keep having conversations like these. 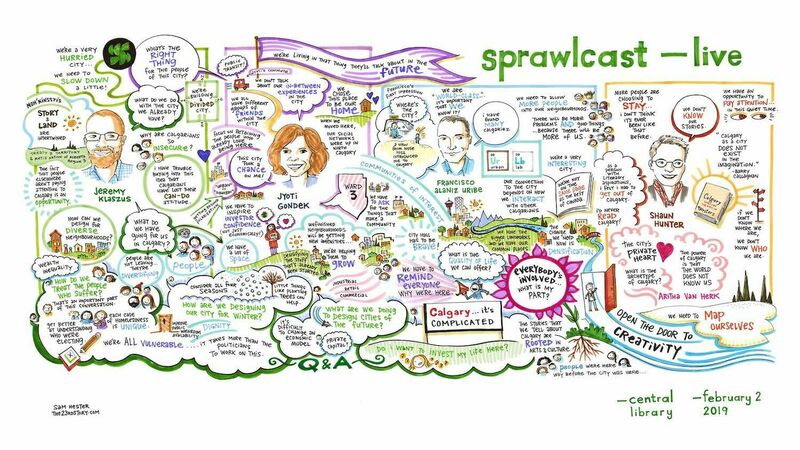 Join the 550+ Calgarians who support The Sprawl! JEREMY: You're listening to a different kind of Sprawlcast. 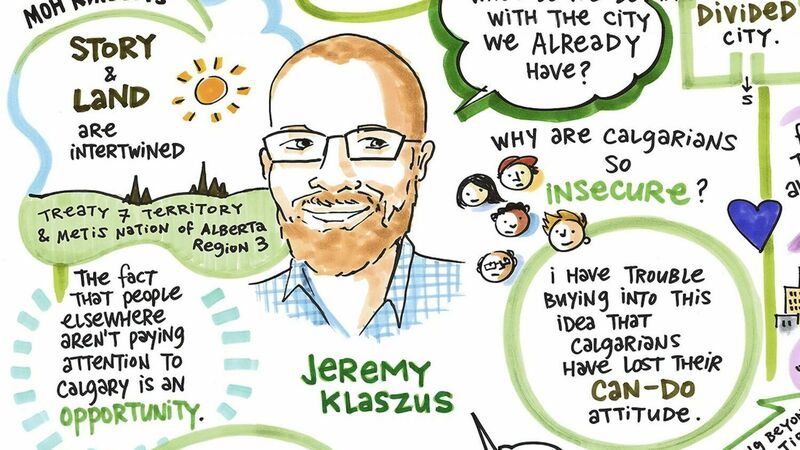 My name is Jeremy Klaszus and I'm the founder and editor of The Sprawl, and Sprawlcast is a collaboration between The Sprawl and CJSW 90.9 FM and we are making this show on Treaty 7 land, so we want to acknowledge the traditional territory of the Blackfoot Confederacy, the Stoney Nakoda Nation, and the Tsuut'ina Nation. Calgary is also home to the Métis Nation of Alberta Region 3. We're going to go now to the new Central Library. 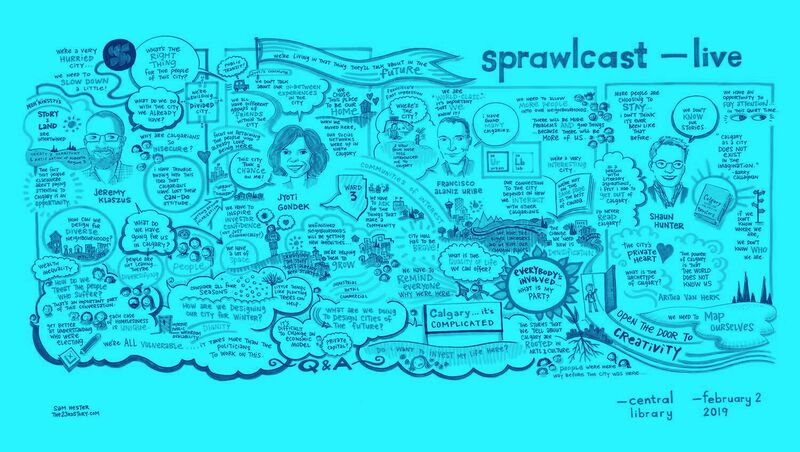 JEREMY: Good evening, everyone, and welcome to Sprawlcast Live – the first-ever Sprawlcast Live. JEREMY: This was on February 2nd. It was a cold winter night, and still probably over a hundred people came out to Sprawlcast Live to hear a conversation about the future of Calgary. This is part of our collaboration with the library. We have a pop-up newsroom in the new Central Library right now, and we're there until mid-March, so make sure you try and make it down and check it out. 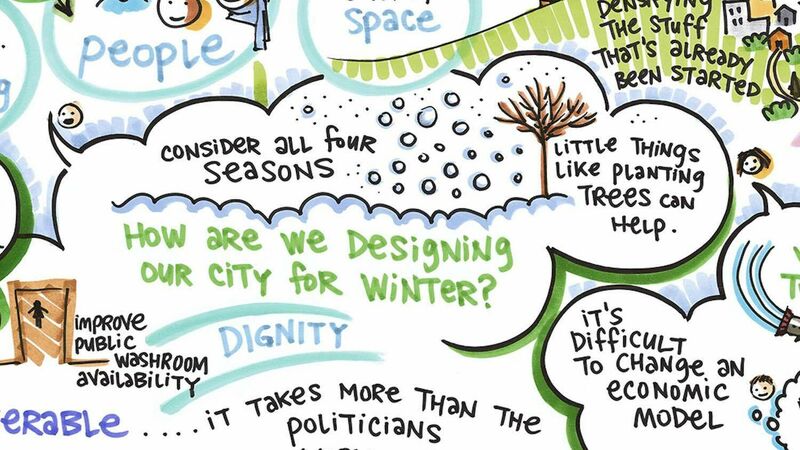 But the idea is really to explore what's next for Calgary and dig into that question. Now, the panellists for the night were local writer Shaun Hunter – she's the author of the new book "Calgary through the Eyes of Writers" – Francisco Alaniz Uribe, who's an assistant professor and the Co-director of The Urban Lab at the University of Calgary's Faculty of Environmental Design; and the third panellist was Councillor Jyoti Gondek, who's an urban sociologist by training. JEREMY: Francisco, it's interesting, because I was reading about … You have written about your arrival in Calgary in 2004. You were an exchange student coming from Monterrey, Mexico. It was a night very much like tonight – winter, minus 20 – and you're in the cab coming from the airport. Go across Deerfoot Trail. You're going down John Laurie Boulevard … and I'm going to read here what you wrote. You're looking into the dark, snow-covered emptiness, punctuated with a few desolate houses in the middle of nowhere. And here's the question you asked: "Where's the city? What have I gotten myself into?" JEREMY: So 15 years later, on a very similar night, I want to put that question to you. Where's the city? Where have you found Calgary in the time since? FRANCISCO ALANIZ URIBE: That's a great question. I think, that night … Well, when you arrive in the cities, you just land in the airport, and then the connection to the city, who knows where you're going through, so I really didn't relate to what a city was here because I'm coming from a country that is very dense – that you know exactly when the city begins. We don't have these extended landscapes, so we have to have very compact cities. So the next morning, which after that night, and arrived, I was hosted by some friends that day. They were visiting students in Mexico City, some Canadian students. The next morning, they took us out to the top of Nose Hill, and I was fortunate that our tour guide that day was a geography professor – Wayne Davies – and he explained from the top of Nose Hill the city, and from that moment on I understood how the river valleys were carved through the ages; how people were here way before the sea was here; and how the rivers were preserved, as much as possible, as a natural environment; and that started, to me, become that city of Calgary. And through … Now I've been here 14 years, and working with community associations and other groups, and I have found many Calgarys, let's say, through those different community associations, different places, but also different Calgarys in terms of communities of interest. Just briefly – I don't want to extend too much about my coming here – but one thing that I tried to do right away was to find a place to play soccer, because for me it was very important back in Mexico. And that became how I met people and how I made friends, long-lasting friends, and those friends were from all over the world: Poland, China, lots of Calgarians, and Canadians from other parts of the country. So that gave me also a different perspective, a different Calgary than the one that I was studying in maps and photographs. JEREMY: Yeah. The many cities within the city. And Jyoti, when you ran for City Council, this was actually a big part of what you were talking about, was Ward 3 – or as I call it, "Ward 3," in quotes. Because you were basically saying this is an area of the city that has been neglected in some ways, and was built in, what, the '70s and the '80s, and just pure houses, not built as a community with a bunch of amenities, but yeah … but just all houses. And so I'm curious how you've experienced – you yourself and the people … your neighbours – have experienced that sense of disconnection, or placelessness within the bigger city. JYOTI GONDEK: So, I don't think it's a big secret that I dislike the terminology of "urban" and "suburban," because it necessarily makes one think lesser, somehow, than the other, and I think when we use that kind of terminology and we talk to people about being suburban there's this sort of shame that's attached to it – you know, if you're living an urban life, you're hip, you're cool, you get it, and if you're suburban, you know, you're sitting on your couch eating bonbons watching soap operas all day. So that terminology bothers me because it labels people. And the thing that I've found about living in Ward 3 since we've been in Calgary – we moved here in '97 – we chose to live there for a couple of specific reasons. One is, that's what we could afford, and that's a factor for a lot of people when they go to buy a home or they find a place to rent. And the other was, our social network – our supports, the people that we knew – lived up in north Calgary, so that's why we made that decision. And it wasn't until about 10 years later when I really started getting into this idea of what does it mean to be urban that I started to realize that labels and forced choices have created this divide between people. So when I ran, it was really to say, we've got this area of the city that was created in a way that's single-use, because that was the trend at the time in planning, was to separate and segregate uses. And unfortunately, it became a bunch of homes and very little else. But for us … My husband is here, so I keep looking up there. Hi. For us, what we found interesting was there was nothing in terms of, really, amenities near our house, but it seemed like the year after we moved there everything started popping up. We had a grocery store. We suddenly had a Boston Pizza within a year. And now, it's embedded in that community. No one can remember a time that those things didn't exist. So even the suburbs or periphery communities do grow, and they grow into themselves, but we have to be diligent and ask for those things that make it an actual community that you can live in and have a life in instead of just going home. JEREMY: And Shaun, you grew up in the suburbs of Calgary. JEREMY: What suburban Calgary neighbourhood were you in? HUNTER: I started in Haysboro and we moved to Southwood, so I was living in the postwar dreamland, right? That's sort of the thinking that was going into those suburbs in the '60s. JEREMY: So it's the postwar dreamland, and yet as a teenager you write about this in your book. For you as a teenager, Calgary did not exist – same as Barry Callaghan. You didn't have a sense of belonging here. HUNTER: Well, I don't know that I was questioning belonging as a child and adolescent. By the time I was in high school, I wanted to get the hell out of Dodge, right? Because it seemed to me, as a person with aspirations – literary aspirations – I had to go to the centre, which is where literature was made, in my adolescent view. I had never seen Calgary in the pages of a novel. I was a reader. I knew, um … I knew Prince Edward Island, because I had read Lucy Maud Montgomery's "Anne of Green Gables." I knew parts of Ontario because I read Alice Munro. I had never read Calgary, and that was an absence, for sure, that has sort of stayed with me through my life. Yeah. JEREMY: It kind of sent you on this quest to find, what is Calgary? JEREMY: Not to get too cerebral about it, but … And what you described in your book at one point, having a packet of news – was it news clippings or something like that? – and saying, I know the city is in here somewhere. I don't know what it is, but there is something in here somewhere. HUNTER: Yeah, and I also knew that this city is very easily demonized by outsiders. The city we see in the national media is a compressed, two-dimensional city. I knew, from my own experience – I spent most of my life here – that it is a much more complicated place, but I needed evidence, and I wanted evidence on the literary page, because that's just who I am. JEREMY: Yeah. And you found it. 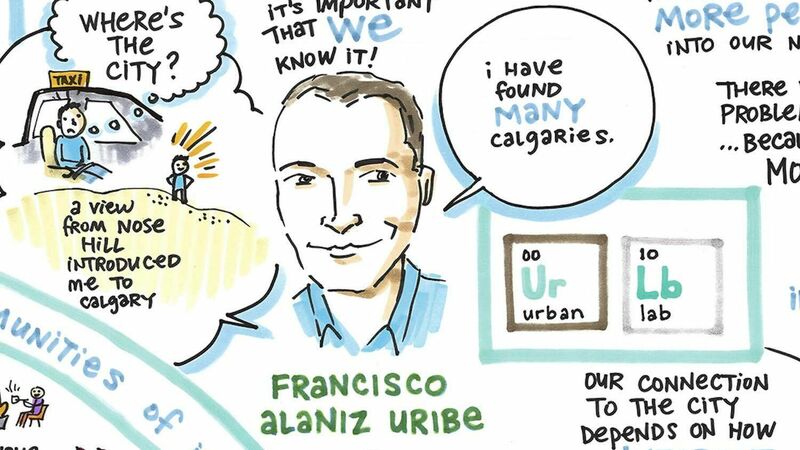 Francisco, you've described … Like, you talk about the many cities within the city. 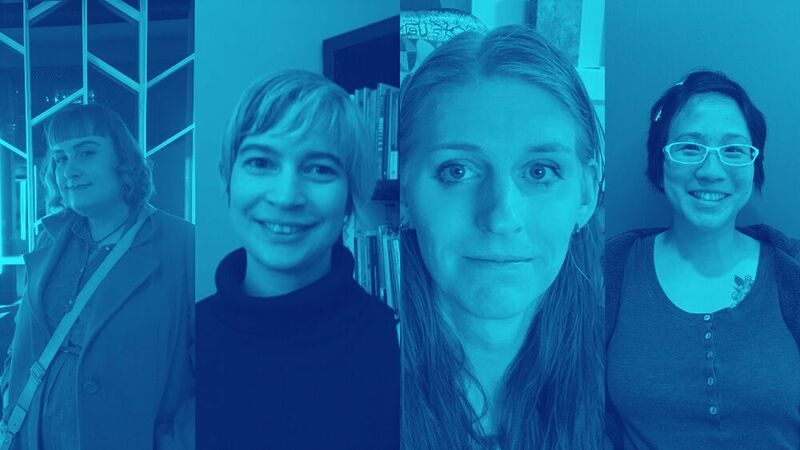 You've used the word "imaginary" – not in a pejorative way, but that we each live in an imaginary bit of Calgary, our own kind of … the coffee shops we like going to, the neighbourhood where our kids go to school, the roads we drive or walk on. In what ways is that tied to our identity as a city – those little Calgarys within the larger city? ALANIZ URIBE: How much is attached to our identity or our connection with the city? JEREMY: Or, sorry, more precisely, as people, as Calgarians, how do we derive our identity from these imaginary communities? ALANIZ URIBE: I think that it's very much attached to our activity in how we experience the city, right? 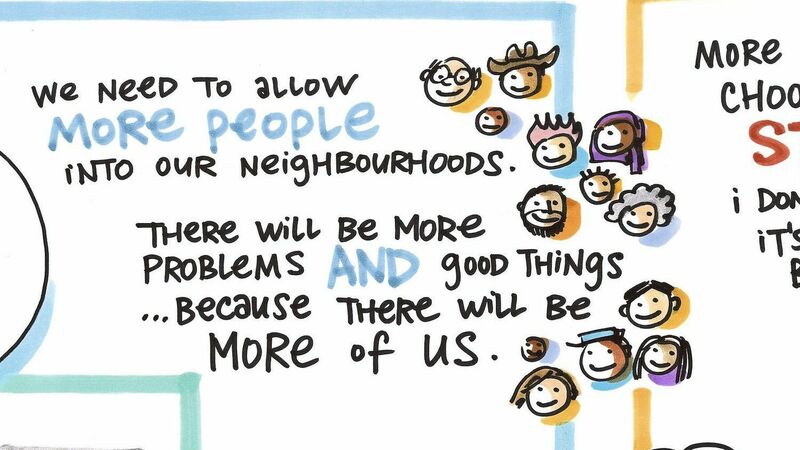 But it's also how we connect with other Calgarians that makes it our connection to the city. So if you continue to go to the same places over and over for whatever – your groceries or your recreation or your social groups – those are becoming your landmarks that really anchor you to the city, and when you move from a city, those are the ones that you start to miss a lot, right? The ones that you … they're very commonplace to you. Now, there's other pieces, larger, within our city that we all … even if you don't live close to them, that they become very marking for you as well, right? The large landscape that we experience. For me, Nose Hill is going to be a big piece of who I am in Calgary – my identity – and the rivers are obviously, not only for us, but anyone that has experienced this city has had an impact by being close to these landscapes, right? And even because they're far away but we can see them all the time. The mountains are also a big piece of that identity. So we have the bigger landmarks and we have our common places that make it very much our own little Calgary, right? Jyoti, going back to your thing about urban versus suburban. I mean, this is an interesting question, and always a relevant one in Calgary because there's always that tension between urban and suburban, and so you say that language isn't helpful. So my question would be, how can we see each other into fuller existence, I suppose? How can we get outside that framework, that polarized framework? GONDEK: Well, Francisco used the terminology of "communities of interest," and that's really important. There's common bonds that bring us together, and I think it's also important to recognize that … You know, it's like when you're a kid, or when you're any age, you have certain groups of friends that you do certain things with, right? Like, the gang that you go on holidays with might not be the people that you're going to go to something like this with, so you have these different groups of friends and you do different things with them. I think when it comes to our existence in the city, it's the same type of thing. When I come to work, I have a certain group of friends that I do certain things with, right? When I go home, I've got a different group of friends that I do different things with. That allows you to explore the city, but we don't often think about that stuff. We do things, but we don't reflect on how or why we do them. So the narrative of our life, as Shaun has mentioned, is something that's silent. We don't talk about it. So we don't talk about the experience of, you know, driving downtown every day to come to work, because that's my life. I get in my car, I drop my daughter off, and then I park right over there and I go and do whatever it is I do. But that's my reality. And then at some point I hope I'm going to get to go home in that same car and go and see my family, but it's the period of time in between that I now take to reflect on what the city is and what it should be and how I can help in making it better. And I have to say, one of the downfalls of Calgary is we did not invest in public transit the way we should have when we started off, because I can tell you we would have a much more connected city and a much more lively city if people could easily get around. So this idea that we have different departments that do different things is a big problem. Transportation necessarily has to be connected to planning, which necessarily has to be connected to neighbourhoods and all of those things, because if you don't think about everyone's daily life and how they get around, you miss so much of it. HUNTER: Oh, good. Thank God. JEREMY: Yeah, so we can point the finger at them. But how do we start to undo that? Francisco, maybe I'll put that question to you. 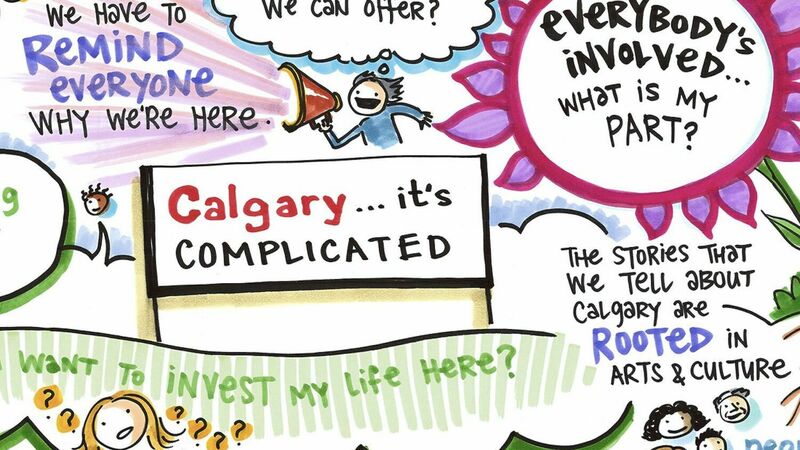 That's such a big question, and City Hall has been wrestling with that for some time, when you think of the ImagineCALGARY process – so in 2006, getting a bunch of different Calgarians together. How do we do the city differently? What do we want for this city? Or Plan It Calgary, the long-range planning blueprint – okay, 10 years ago, let's try and densify the existing neighbourhoods. But it seems it still struggles. So how do we steer that ship around? ALANIZ URIBE: It's a huge struggle. So for those of you who are not related to planning and these sort of boring topics, but … There is one goal that we have as a city. Right now, whoever needs a house, 90 percent of the population that need a new home are getting it at the fringes of their city. The goal that we have as a city is that 50 percent of those people are going to be able to find a place within the area of the city that is already built. Now, that's the challenge. What we're doing right now is still 90 percent of the people can only afford, or maybe they only have that sort of choice, towards the edges of the city. How do we revert that? I think everybody has a role in this, right? So from City Hall, they have to show us leadership and… us, as citizens, we have to understand that we need to allow more people into our communities. And yes, there's going to be less parking spots, probably. Yes, there's going to be, maybe, increase in petty crime and vandalism, probably, because there's more of us. That's it. Not because bad people are moving in. No, it is because every time you have more people, you get more of everything – the good and the bad. So how do we revert this? I think everybody has to really reflect that our city has always changed, and that the change that we need now is a change of densification, so then we can afford things like more places to walk; places where you can, within your community, buy the groceries that you want; that you can maybe go for a coffee and meet a friend; or that you can, as a city, in terms of financials and running our infrastructure, that we can afford a better transit that is a real option, because right now many parts of our city will have a bus, but it will take you 45 minutes to reach your destination than otherwise takes you 10 by car. So it's really … We need to be a more compact city. That's where we have to focus on, and there are so many actors. I will say everybody's involved in some part on this. But that's the challenge, and maybe the reflection behind that is, what is my part on that challenge? JEREMY: Shaun, maybe now is a good time to hear from Aritha van Herk. JEREMY: The bard of Calgary, as you put it to me earlier, which I think is fair. HUNTER: Yes. 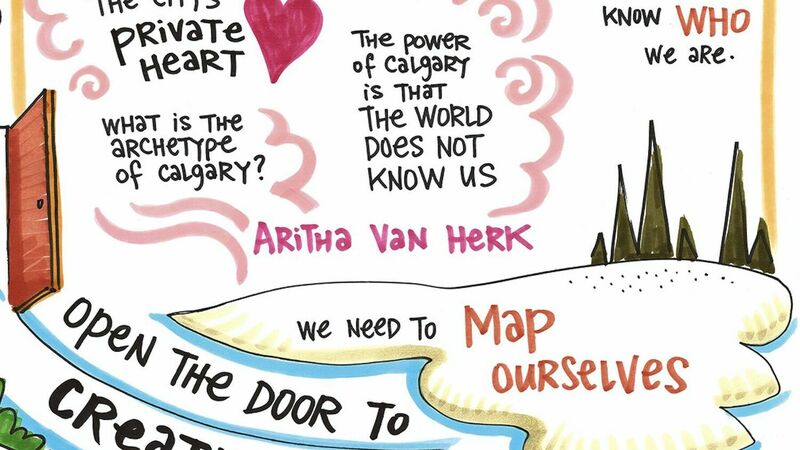 So, Aritha van Herk is one of your colleagues at the University of Calgary, teaches English and creative writing. Aritha has lived here since 1983, I believe, and this is clearly her hometown. She's the person I turn to when I want to see the complexities of Calgary. She explores, in her various kinds of writing – nonfiction, fiction, and prose poetry – "the city's private heart," and that's a phrase I'm stealing from one of her essays. "We think that we are separate from this city. That we live here but do not live here, mere bystanders to its crazy spread, it's rumoured consumption." "We are reticent as our own obscurity. Late at night, under a stalking moon, our history sings behind closed doors. Night infects our waiting. What is the archetype of Calgary? A faded sign, a bloated sunset? A bleak façade that cannot shelter the wind? That wind our city wall, while the noisy bars serve as our cathedrals, worth a visit to say a quick novena, to mourn what's lost." "The power of Calgary is that the world does not know us, does not even want to, dismisses our gas stations and brusque roads, assumes we are forsaken, mangy, dis-tempered. "We might petition ourselves to be braver, but this is a vulnerable city, shy, taciturn to a fault. We hesitate to speak, and when we do, cannot help but declare a series of truths. Your radishes taste delicious. The train is late again. I want to tell you that I want to fall in love with you. Again. I have found your gloves. Be gentle with me." JEREMY: That runs against everything we hear. We need to be on the map. We need to … We've got to be world-class. That's one of my perpetual questions: Why are we so … in this city, so insecure about what we are? I'll just throw that out to anybody who wants to jump in on that one. GONDEK: I don't know why we're so insecure. Like, I have to say, we chose to move to Calgary. I chose this place to be my home because I thought it was the kind of place that could take a chance on me. I lived in Winnipeg, and I – you know, true story – applied for 200 jobs after I got my BA – 200 – and got exactly zero callbacks to anything, so I felt like a loser and I didn't think I could make it. And so I happened to be working at The Keg slinging lunch for people, and someone came in and said, "Hey, aren't you in the sociology program?" And I said, "Yeah, yeah. Working on my MA because I can't get a job." And she said, "I'm actually leaving my job as a policy analyst with the government across the street. You should apply." And so that's how I got my first, you know, big-girl job, and it wasn't what I wanted to do. I just couldn't do what I wanted to do. And so when we left Winnipeg, thank goodness – Todd got a job in Alberta – we were living in Wainwright, and there was not a lot of options there either. 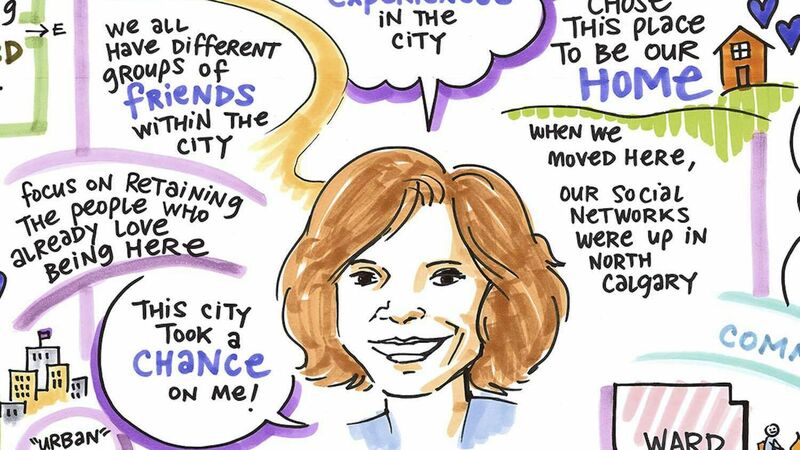 So when I had an opportunity in Calgary, I was excited, and when we moved here, I was excited, because I could do the work I wanted to do, and I have been able to change careers and do the things I love to do, and now I do this work of city-building every day. This is an absolute privilege, and this place gave me that chance, so this city took a chance on me because it's full of people that understand it's okay to be a little bit different and think differently. That's how we became who we are, but we don't talk about it. We're so busy trying to be something that people can understand, we don't tell our stories. HUNTER: We don't know our stories. There are plenty of stories in this town, I would argue. But we don't know them. So what's that all about? GONDEK: We're in this building, for God's sake. GONDEK: We're all aspiring all the time. ALANIZ URIBE: But I think there's so many interesting things happening in the city, and one of the newer Calgarys I discovered is all these microbreweries. And when you go and have a beer in these places, there's lots of people with common interests, and the conversations are different than other places you visit, and this just changed in a few years. I think we're a very interesting city because we have a lot of interesting people. JEREMY: Yeah, and I'm glad to hear you say that, because I feel like, of late, there is a lot of negativity – not just about what's happening economically, but about the city as a whole. Nothing is going on in Calgary. We've lost … Or, there's that line, we've lost our can-do attitude. All this kind of stuff is kind of put on the city, and I have trouble buying into that, and I have trouble buying into this idea that we need to … yeah, be something that is so impressive to everybody else. It's interesting. What was the phrase you just used – we have stories, but we don't know them? HUNTER: We don't know our own stories. Yeah. And that … I mean, look it. This was an outpost. This was a place … It still maybe sort of is, but it's a place where people came and left. Few people stayed. But now we're a million, what? Three? More people are staying put, and that changes... There was a lovely conversation between Aritha van Herk and Robert Kroetsch, an esteemed Alberta-born writer, deceased now. You have to stay to build a culture. And there are more of us staying here. 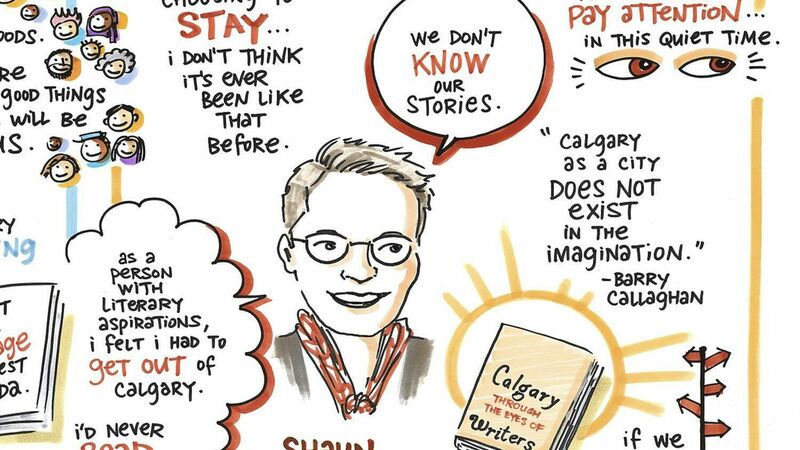 I had a chat with the Historian in Residence, Kevin Allen, before Christmas, and he called it … His sense was that more people are investing in Calgary, and not in the financial sense, but investing … putting their … this is home. I don't think it's ever been like this before here, and I see that as only a positive. JEREMY: You've been listening to Sprawlcast. Our theme music is by Dan D'Agostino and Kenny Murdoch, and our CTrain narrator is Holly McConnell, and I want to give a special shout-out to Manpreet Singh of the Calgary Public Library. He's the guy who got us up and running with Sprawlcast Live on that cold Saturday night, and he was actually filling in for somebody and made sure everything ran smoothly. So, many thanks, Manpreet. Appreciate that. You can find our pop-up newsroom at the new Central Library until mid-March. Come in and take a look around and leave your say for what you want Calgary to be in 2044, 25 years from now, and stay tuned for all the reporting that's coming out of this project. You can find that online on our website, www.sprawlcalgary.com. A... we're also making a one-off newspaper at the end of this project – an actual newspaper that you can swat a fly with – so stay tuned for that. Thanks for listening, and see you next time!